The impact it has on layman is tremendous. Yes it is simple, simple in execution and easy for audiences to follow. The Entertainer removes a deck of cards and discards the box, he/she then picks up a small note-pad and pen. 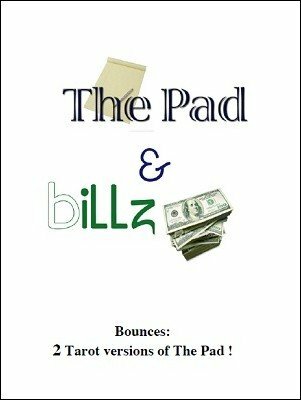 The performer makes a note on the pad....a prediction. The cards can be borrowed, thoroughly examined and shuffled to their hearts content. The spectator deals cards until they want to stop. The performer places the pad on the table. The spectator reads aloud the prediction. The spectator THEMSELVES turn over the card. It is a perfect match. NO GAFFS OF ANY KIND. Everything Can be BORROWED! BILLZ is T.C. 's Borrowed Bill Serial Number Divination ROUTINE. As a bonus you will also receive a 2 FREE offering from TC's book, In The Play of Shadows: The Tarot Effect. T.C. will walk you through a bizarre tail with his enchanted effect: For the Price of a Stamp, as well as What's in Your Wallet.